On May 17, the Canadian Cultural Centre inaugurated its new space, at 130 rue du Faubourg Saint-Honoré in the 8th arrondissement of Paris, now adjacent to the Embassy of Canada in France. By thus concentrating its presence to create a new dynamic, Canada brings together culture and diplomacy: it gives culture the role of a major ally in its diplomatic mission, and the visual arts a new gallery, which constitutes the heart of the new building. On this occasion, which marks a turning point in the history of the cultural relations between Canada and France, the Canadian Cultural Centre/Embassy of Canada in France, the Institut National d’Histoire de l’Art (INHA) and the Archives de la Critique d’Art are delighted to announce an exceptional partnership focussing on the visual arts archives of the Canadian Cultural Centre. 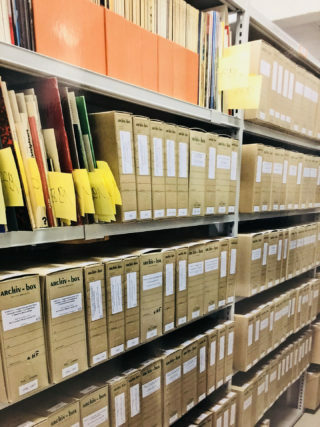 The Canadian Cultural Centre, under the aegis of the Embassy of Canada and Global Affairs Canada, has donated twenty-five years’ worth of archives to the Institut National d’Histoire de l’Art (INHA) for the Archives de la Critique d’Art collection. Located in Rennes, the collection operates within the framework of the Groupement d’Intérêt Scientifique (GIS), which brings together the INHA, the Université Rennes 2 and l’Association Internationale des Critiques d’Art (AICA). The collection is unique because it combines an act of cultural diplomacy and a vision of Canadian contemporary art. The Centre’s endeavours represented by those archives highlights close ties to the French cultural and institutional scene and the history of art criticism in France. The collection covers twenty-five years of exhibitions at the Canadian Cultural Centre, visual arts partnerships between the Centre and many French institutions and cultural organizations, and documents related to the history of the Canadian Cultural Centre since its foundation in 1970. Its methodological consistency, diverse content and cultural scope make it a unique source of documentation, which will constitute a invaluable resource for researchers, both national and international, as well as an instrument for the continuous promotion of relations between Canada and France, and beyond. The exchanges with the artists, curators, critics and authors form the core of this collection, which preserves the traces of human relations and not only institutional writing, relations that had led to several hundred of significant projects that took place in France between 1993 and 2017, and entailed the action, investment and support of the Canadian Cultural Centre. This gift is an important symbolic act for Canada and France, as well as an act giving concrete form to the relationship of trust and ties of friendship that bind our two countries. The fact that the archives are now kept in France is in line with Canada’s diplomatic objective. Canada and France have a shared intangible cultural heritage of which this collection is now a significant trace. The first part of the collection was transferred in March and is already accessible to researchers in Rennes. A second part will be transferred in the fall. In addition to the donation of archival material documenting the period 1993–2017 of the Centre’s visual arts programming while it was located on the Esplanade des Invalides in the 7th arrondissement of Paris, the partnership provides for later donations that would continue to enrich the collections in order to preserve and highlight the history and actions of the Canadian Cultural Centre in its new premises. The Archive de la Critique d’Art collection, which mainly concerns the dissemination and reception of contemporary art, has thus been enriched by this gift, which will find an echo in the present collection and give it meaning. Actions highlighting the collections will soon be offered to researchers and the general public. The Canadian Cultural Centre, the Embassy of Canada, Global Affairs Canada, the Institut National d’Histoire de l’Art, the Archives de la Critique d’Art, the Université Rennes 2 and the Association Internationale des Critiques d’Art are proud of this major event in our cultural diplomacy.